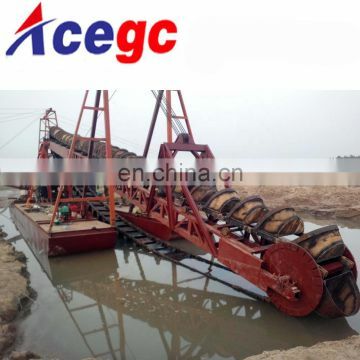 River bucket chain ladder gold dredger dredge for sale is one of the mechanical dredgers. 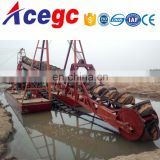 This type of gold bucket chain dredger actually is composed by two parts. 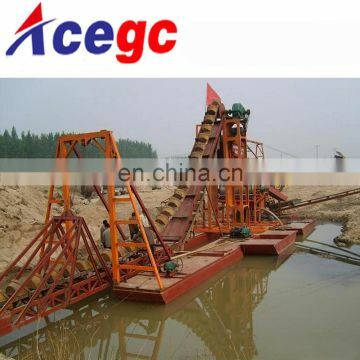 The first part is the sand or mud dredging system. 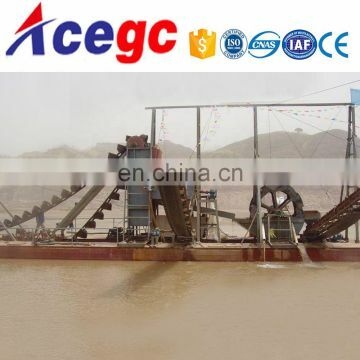 This system used the square buckets to scoop the sand,mud and gravels up. 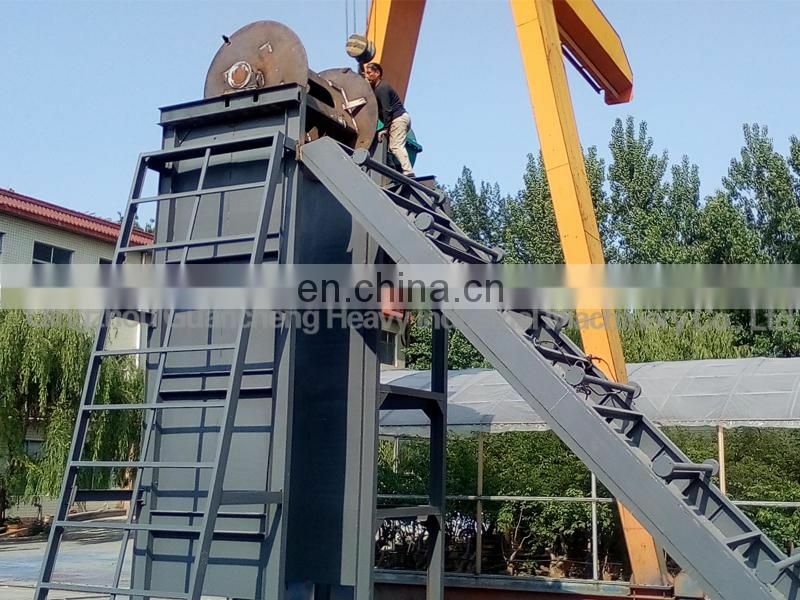 Then the trommel classifier will separate the gravels first when breaking the clay with the iron chain inside the trommel,which makes it easy to separate the gold. 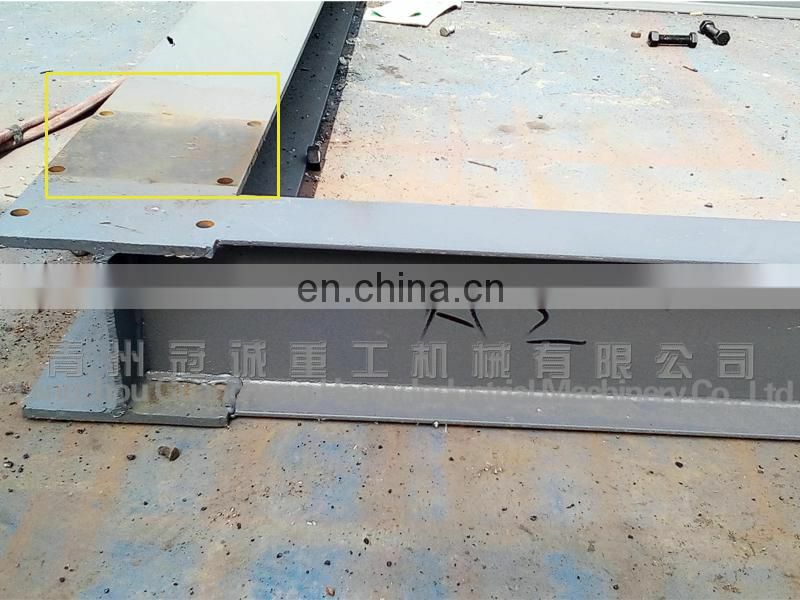 The gold separating system could be customized according to customers' gold size and shape. 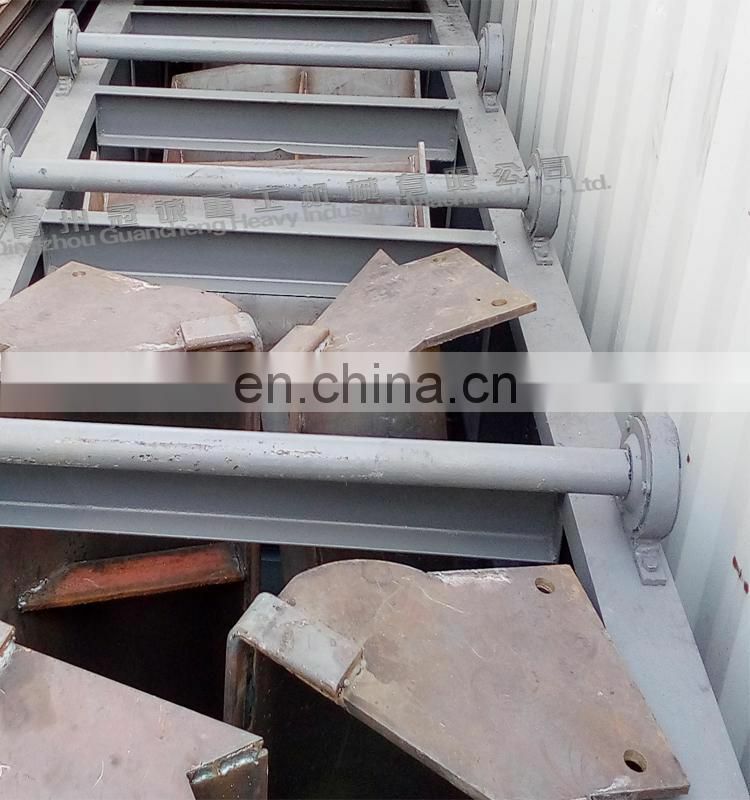 Usually we recommend jig(for nugget gold), shaking sluice box and centrifugal concentrator to separate the tiny particle gold or flower gold. 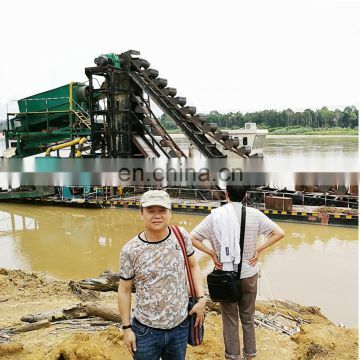 After the separation of the gold, the gravels and sand could be transported by conveyor belt or the sand could also be transportated by pump. 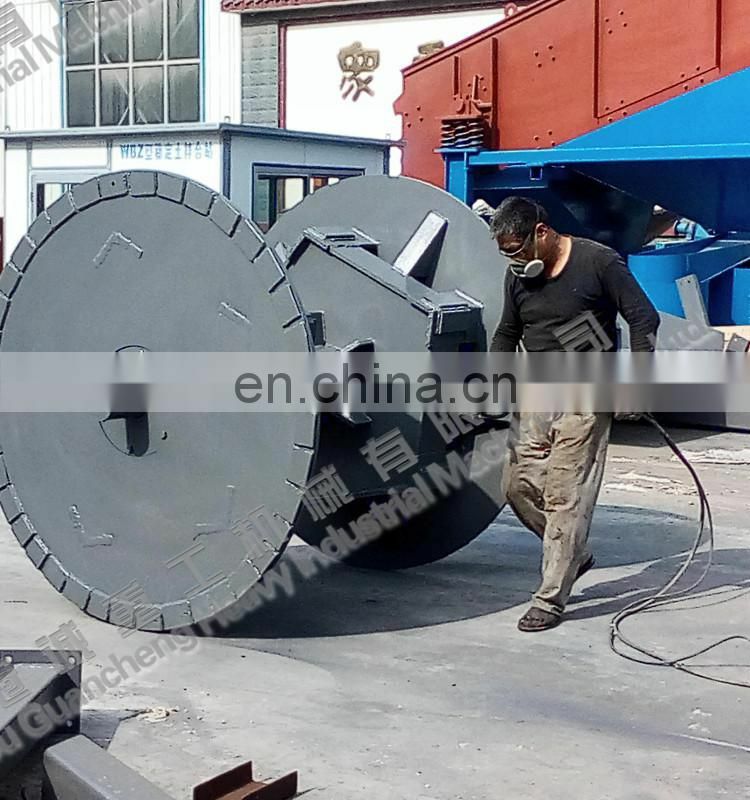 1) Completely assembled and fully tested before delivery. 2) Simple, rapid assembly and dismanting. 3) Standard design, allowing early delivery and low price. 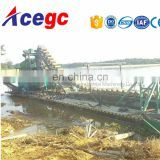 4) Reliable engine cappability, dredging pump capability and hydraulic system. 5) Fresh water engine cooling system. 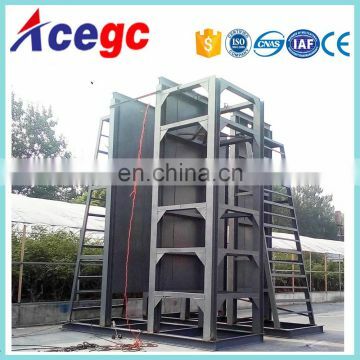 8) Air conditioning - vessel standard equipment. 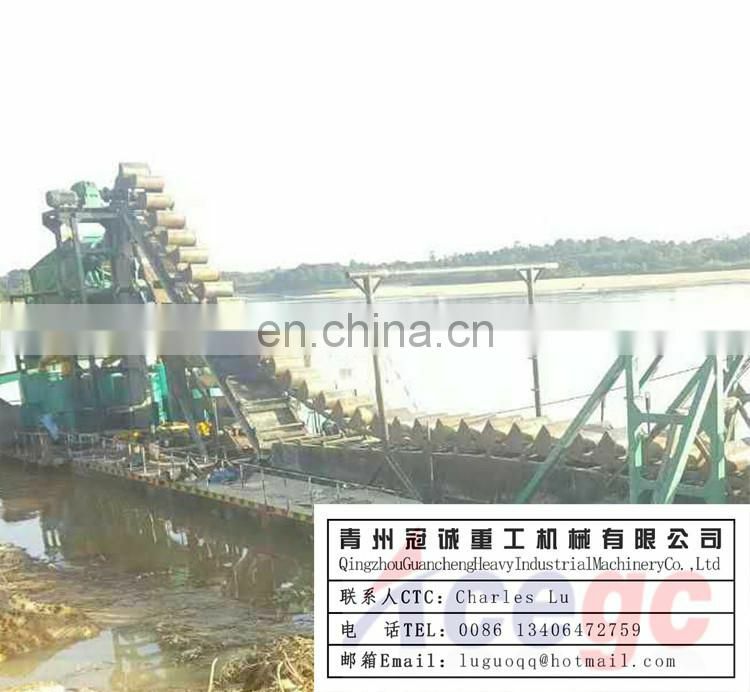 Normally we manufacture the parts in workshop,when workers accomplish and finish the work the QC exame,then installl the dredger to check wholly running and marks when disassemble the dredger.All of this is to a good quality and performacne of dredging machine. 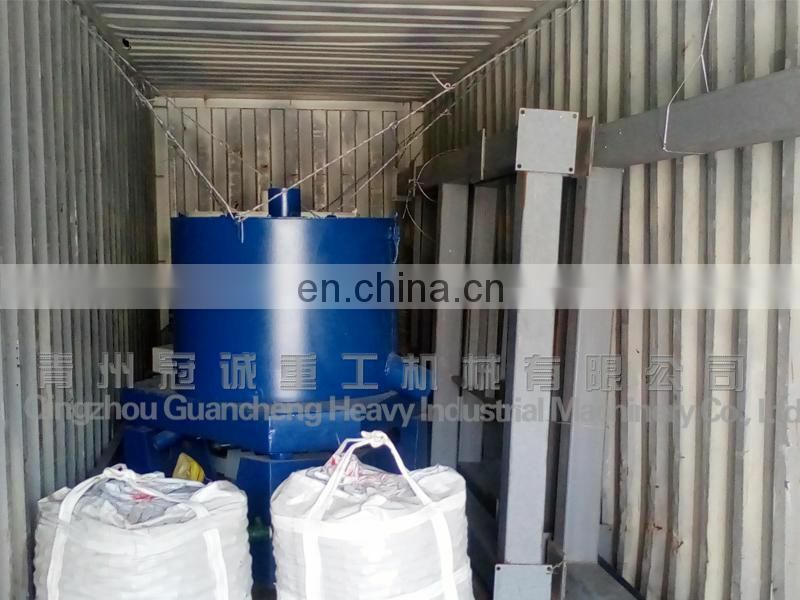 After the teset and pre-installation in factory and finally the container loading comes and there are some points here what we do to keep the dredger in good condition. 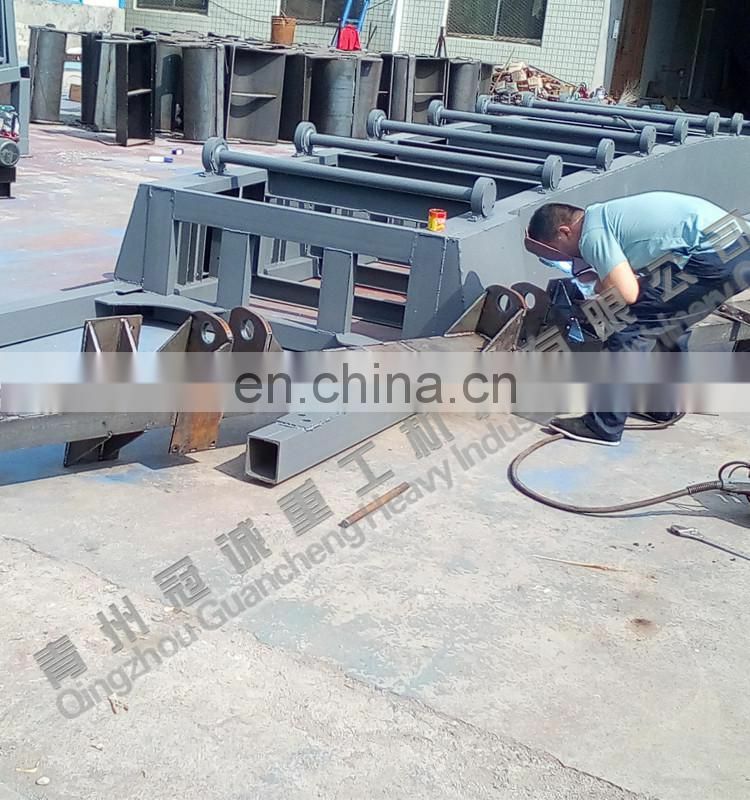 Qingzhou Guancheng Heavy Industrial Machinery Co.,Ltd is a famous mine machinery factory in china. 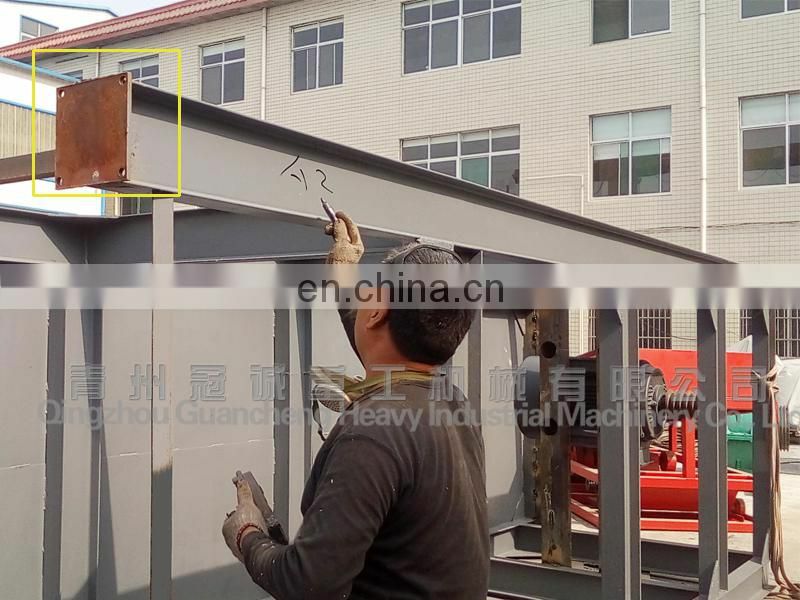 Established in 1992,now we have 3companies,Guancheng,Qingzhou Kaishan Heavy Machinery Co.,ltd&Hongkong Kaishan Group International Trading Co.,ltd. 10years experience&our own professional engineers providing the proper solutions. 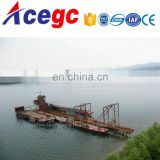 ----We could provide the factory price to you. 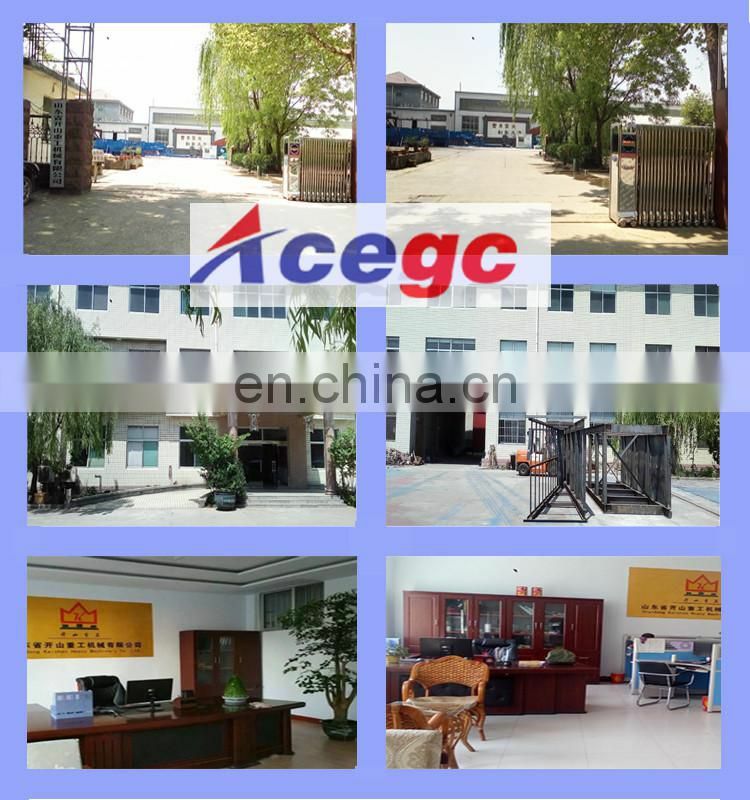 ----The factory has have more than 10 years' production experiences. 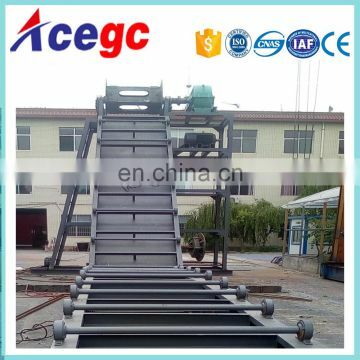 ----In addition, we are famous for our gold separating machines. 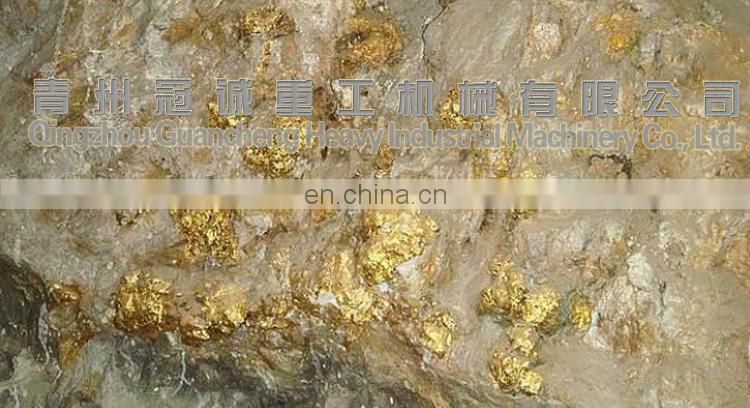 And the city qingzhou we located in was the home of gold separating machine in China. 3. 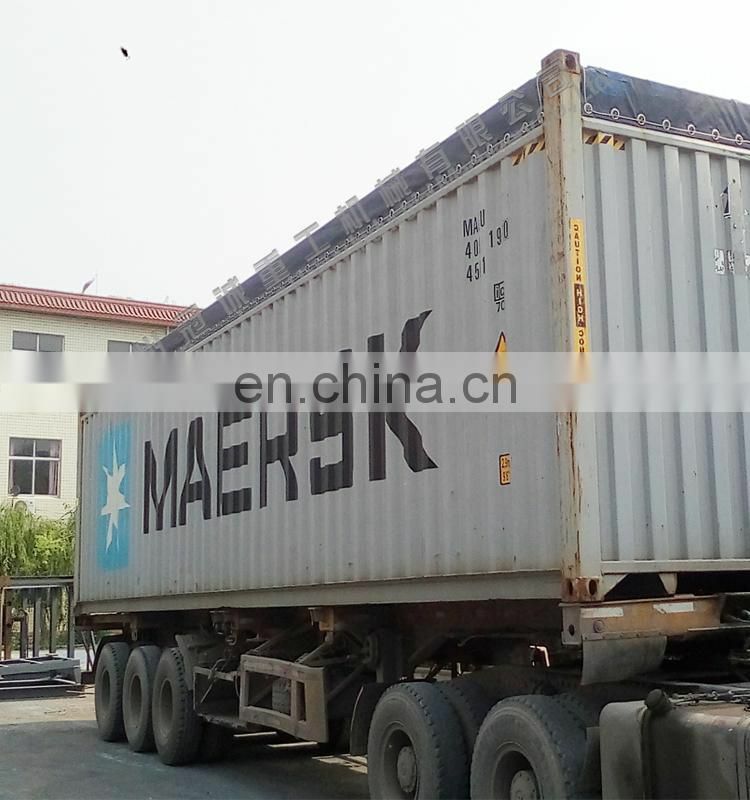 Fast delivery-----Goods be sent out within 7 to 30 days based on order quantity. 4. Best service-----Answering your e-mails&solving questions timely. 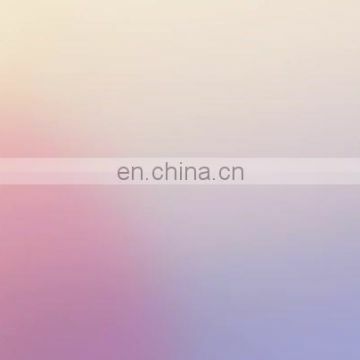 Delivery and update information on time. 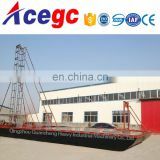 Trust, good quality and service are the basic of long-term business.